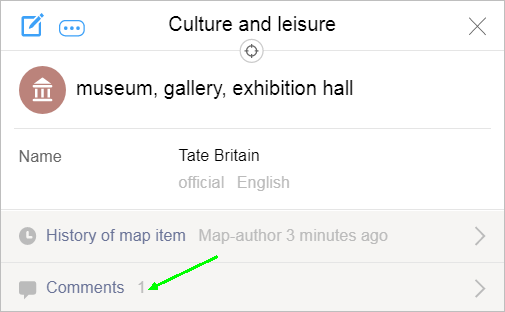 You can add comments to any item on the map. Your comments should relate to that item and meet the general requirements for item comments in YME (see section 3.1. General rules). Map item comments are intended to aid discussion during the course of drawing and editing an item, including to discuss the current state of an item, its characteristics that influence its attribute values, and how to correctly draw it. The purpose of comments is not to leave “basic” business information (contact info, descriptions, address), and it is not for advertising or sharing your personal opinion about that establishment. Tap Send. The text you entered will be saved in the comments for the selected item. In the “Comments” window, a field where you can enter further comments appears. If you need to add another comment for the item, enter your text in the field and click Send. To return to the attribute panel, click Back . To exit from the “Comments” window and the attribute panel, click Close . Select the item on the map. Click Comments in the attribute panel. In the window that appears, you'll see the comments. You can also read all the comments added to the items you've worked on in the “Notifications” window (see section 2.10.10. Notifications for authors).